Hitachi today announced that it has developed an all-in one, container-type energy storage system as a core energy product for ensuring the stable use of distributed renewable energy such as wind and solar power, while maintaining the power supply-demand balance. This energy storage system fuses Hitachi's electricity grid control technologies built up in the Hitachi Group and Hitachi Chemical Co., Ltd.'s battery-related know-how and will be offered as a packaged system. In the beginning of 2014, Hitachi plans to begin demonstration test of this energy storage system in North America. Plans call for Hitachi to reflect the results of this testing in a commercial product after verifying the commercial viability and performance of the system in the electricity trading market, or the so-called ancillary market connected with maintaining the electricity supply-demand balance. 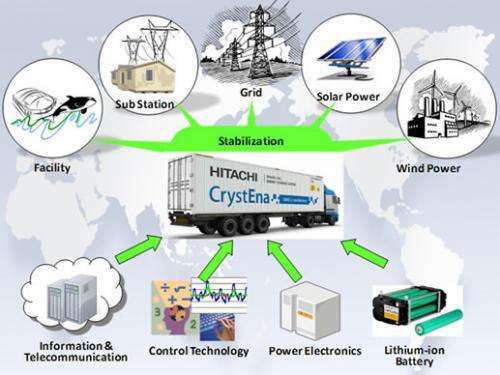 Furthermore, Hitachi will examine whether to promote the system, to be named "CrystEna" (Crystal+Energy), as one of its solution businessess for expanding the transmission & distribution business in the global market. I'd take an Ambri System's container over these any day of the week. Liquid Metal batteries > Li-Ion for large scale energy storage.